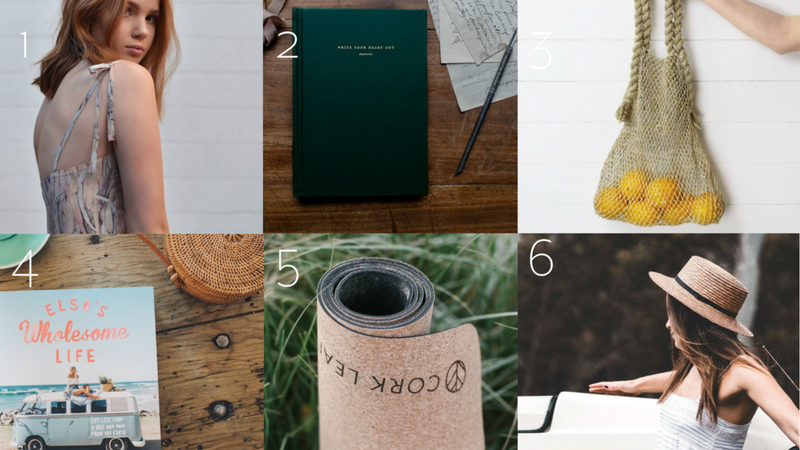 We’re all for buying with awareness this festive season so we’ve compiled a list of our favourite eco gifts! 1. Sleepwear: a dedication to the forgotten rituals of rest and simple living. Quiet Sydney offers a beautiful soft and feminine range of sleepwear - proudly made here in Sydney, Australia, using only naturally luxurious and sustainable materials for every detail possible. 2. Journal: inspires to 'Write Your Heart Out'. A timeless keepsake is filled with everyday journaling prompts to help you preserve your story throughout the year. Made in Australia using Italian fine art paper and traditional English library buckram. 3. Fair Trade Market Bag: perfect as shopping bags, yoga bags, beach bags and stylish storage around the home. We love how strong they are and made using sustainable and renewable hemp. 5. Yoga Mat: Of course we had to include our beautiful cork yoga mat - the perfect gift for those who want to rekindle their yoga practice in the New Year. 6. Straw Hat: the classic 100% straw boater is perfect for days of summer. And what's even better, Will & Bear have partnered with trees.org to plant 10 trees for every hat sold!